The Master Gardener program trains adult volunteers to disseminate up-to-date, research-based horticulture information to home gardeners. This volunteer organization is sanctioned by Land Grant universities in all 50 states. In Illinois, the program is sponsored by University of Illinois Extension. More than 70 volunteers are actively involved in the Master Gardener program in the multi-county unit that includes Coles, Cumberland, Douglas, Moultrie and Shelby Counties. Gardening enriches people's lives and communities. U of I Extension Master Gardener volunteers have the opportunity to learn about environmentally friendly and practical gardening techniques specific to central Illinois. They are able to share that information with others in our community in a variety of ways including the Idea Garden, newspaper columns, Facebook posts, workshops, presentations to local organizations and more. 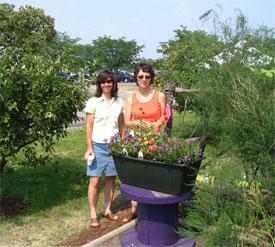 A desire to learn and share research-based home horticulture information with area residents. The willingness to follow U of I pest-control recommendations. Time to devote to training sessions and volunteer opportunities. Potential applicants are recruited throughout the year; the application deadline typically is in mid-December. Class sizes are limited, and applicant interviews are conducted in early January to ensure applicants' goals are a good fit for the mission and goals of the program. Once accepted, attendance at all Master Gardener training classes is required to complete the training. The training sessions are offered on Tuesdays from late January through mid-April, and are led by University of Illinois educators and specialists. You will be asked to pay a fee of $150 to cover the cost of materials, which includes a comprehensive Master Gardener reference manual and additional training materials. The manual is yours to keep. Does each county have its own Master Gardener program? Within our five county unit, there are active Master Gardener groups in Coles, Cumberland and Moultrie-Douglas Counties. These county-level groups meet on a regular basis to plan projects and exchange ideas. The Coles County group is the largest of the three, They meet on the first Tuesday evening of each month to plan events and tours, learn new techniques, share cuttings and have fun. Master Gardeners from Cumberland, Moultrie-Douglas and Shelby Counties are welcome to attend these meetings, as well. Call 217/345-7034 to find out how you can get involved.